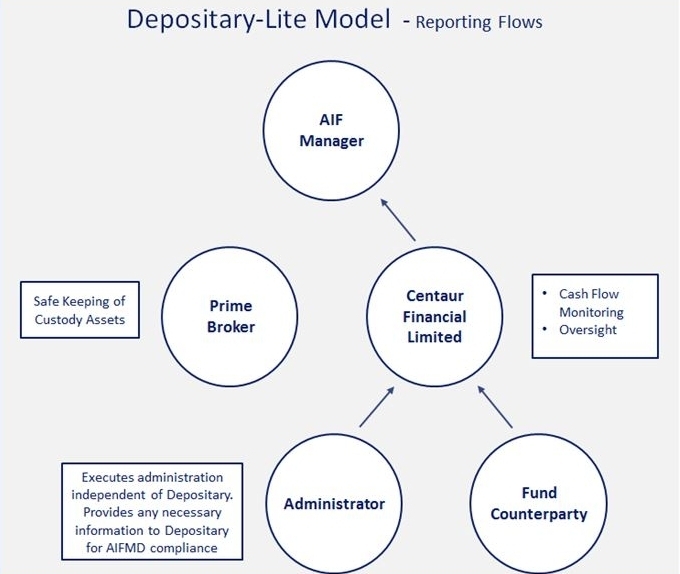 Centaur Financial Limited (“CFL”) provides independent depositary services for managers of non-EU domiciled alternative investment funds, assisting you in meeting your Alternative Investment Fund Manager Directive (“AIFMD”) responsibilities. Our experts assist you with the AIFMD regime and work with you to ensure you meet your depositary requirements in a timely and efficient manner. Check the consistency between CFL’s cash position records against those of the AIFM. Escalate any issues identified by the above. Minimum Disruption – Our solution is the simplest & most effective in the market. Expertise – Experienced industry professionals deliver a high level of client service to AIFMs and Boards of Directors. Accountability – We take responsibility for the accuracy and timeliness of our work. This is reflected in our Service Agreements. Technology Guarantee – Award winning technology infrastructure, with detailed reporting and a full Disaster Recovery plan in place. Cost – We provide a cost effective solution for our clients.